Sound depends on the muffler. The sound of high performance muffler can be anything from a low, throaty growl to an ear-splitting roar. The perfect muffler will deliver just the right growl, roar, or rumble to push your vehicle’s performance and appearance. 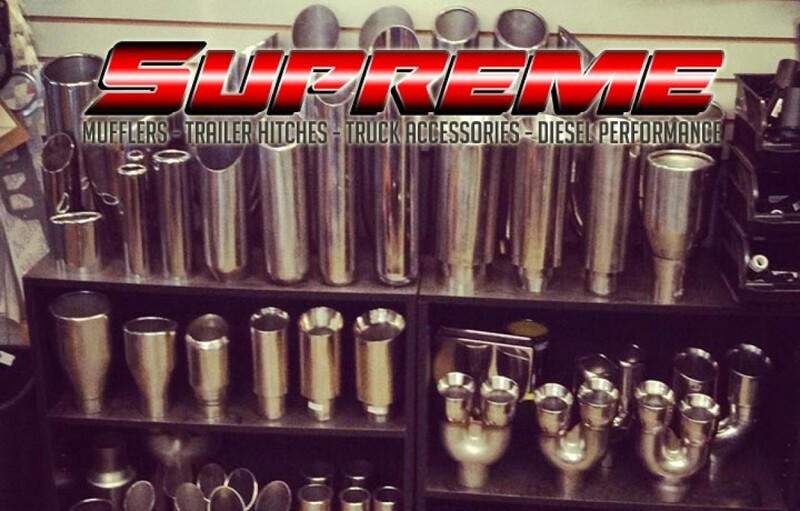 This is why it important to choose the right muffler for your vehicle and to consult an expert like Supreme Muffler to make sure you choose wisely. Is it a single or dual system? What is the exhaust pipe diameter? How much room is available for the muffler(s)? Chamber mufflers are designed to reduce exhaust noise while providing a throaty performance sound for the street. They use a series of inner chambers that are configured at specific lengths to reflect sound waves against each other. As the sound waves bounce into one another, they cancel each other out, causing a reduction in exhaust noise. The exact exhaust tone and noise reduction of chambered mufflers depends on the size and number of the chambers. Some manufacturers also use sound-deadening baffles or inserts within the chambers to further reduce or alter exhaust sound. Turbo mufflers use a set of perforated tubes typically, which often guide the exhaust gasses through the muffler in an S-shaped pattern. The S-design allows the gasses to travel through more tubing for better noise reduction, but this design is more restrictive. Some Turbo Style mufflers have sound deadening material packed around the tubes for increased muffling. Straight-through mufflers, or glasspacks, are designed to allow maximum flow and horsepower. These mufflers feature a straight, perforated pipe wrapped in sound absorbing material such as fiberglass packing. This design allows exhaust gas to flow through the pipe with very little restriction. The bi-product is that it provides less sound reduction than chambered mufflers. The straight-through design also tends to be more compact than other muffler styles. A Muffler must be tough. It has to handle high pressure exhaust gasses, absorb impact from road debris, and resist corrosion. Manufacturers typically use a three-layer body consisting of an outer shell, an inner case, and a slightly insulated layer in between. The muffler body is usually made of aluminized or stainless steel. The advantage of choosing an aluminized steel muffler is cost. Aluminized steel is generally less expensive than stainless steel; however, stainless steel mufflers offer superior corrosion resistance, durability, and will last longer than the aluminized steel versions.